You never know who you are going to meet when you sign up for a Smartours trip. Even though I am traveling throughout Croatia, Slovenia and Montenegro with my husband and friends, I was still a little concerned about the 25 others joining us. When I first met Jan Gronski on this trip, he reminded me of a deep sea fisherman with his stocking cap and a flannel looking shirt. Boy was I wrong. He turned out to be a retired executive from Cisco who was in charge of product development in China for many years. Yes he lived there and has a stunning Chinese wife who is on this trip as well. Jan carries an iPad with him everywhere. I have never seen anything like it. 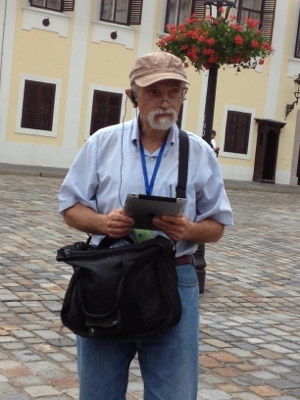 While others use digital cameras or iPhones to shoot photos on the trip, Jan uses his iPad. He said he is able to frame the picture better and capture all of the details. Jan admits that an iPad is heavy and cumbersome for walking tours, but the quality of pictures just can’t be beat. He doesn’t understand how everyone else can shoot photos through little view finders. After you see Jan’s photos you begin to think the iPad is the way to go. 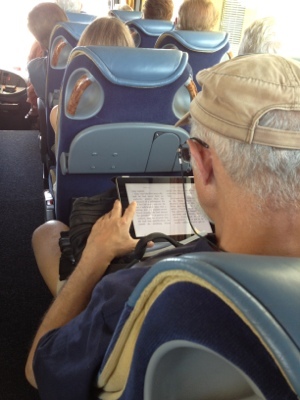 Jan also uses his iPad to read Kindle books on the bus rides from city to city, and in the hotel lobbies late in the evening. He is upset with Apple and Amazon, owner of Kindle, because you can’t buy ebooks through the app. You must always purchase via the web. The iPad is very important to Jan because of an iOS application called NCIKU that allows him to access a Chinese dictionary. He checks on Chinese characters that help him express what he is trying to say. When I see him using the program it looks like he is drawing stick figures but he is actually practicing the alphabet. Jan posts most if his photos on Facebook. He lives down the street from the HQ in Palo Alto, CA and his daughter works there as well. She is one of many responsible for more people to respond to Facebook advertisements posted on member pages. Jan admitted he is involved in some secret Facebook assignment with another friend who works for the company. I can’t say anything further. He doesn’t know that I devoted an entire post to him so let’s see if he ever finds out.